Sell your STEVE HACKETT items on eBay ! Great live record by the Guitar Master! Yoooha . what a great record! I can only assure you that this is the kind of progressive rock live record that you should never missed at all regardless you are a fan of Steve Hackett or prog rock fan. It's so attractive from beginning to end featuring Hackett's best classic tracks until "Momentum" album. Having been years in my collection (I purchased this CD 24/12/1996), I did another spin again yesterday to find out which of the featured tracks were not good ones. I found only one mediocre (so and so) one, i.e "Hope I don't Awake" (my taste - sorry for those who love this track from "Cured" album). The rest? They are not just good but ranging between excellent to masterpiece! I'm not exaggerating on this. Please do find out yourself and I bet you would have the same (or at least similar) with me. I put my neck on this bet! This set was recorded from two venues - Nothingham Central TV studio on October 1990 and Savoy Theater NY on November 1981 - with Steve and John Hackett being the permanent members. Tracks 1-5, 13 and 14 were recorded from Nottingham venue while tracks 6 - 12 were recorded from New York venue. In Nottingham, the other band members were : Ian Ellis / bass, vocals, Julian Colbeck / keyboard, vocals, Fudge Smith (of Pendragon) / drums. In New-York, with: Chas Cronk / bass, vocals (whom you might be familiar playing with Rick Wakeman), Nick Magnus / keyboards, Ian Mosley / drums (would later join Marillion until today). Actually I was reluctant to buy this CD as I had already owned the laser disc version with the performance footage on the Nottingham venue. This CD offers differently with half of the set taken from New York with Ian Mosley on drums (I really wanted to hear his drumming) and also Chas Cronk on bass that I usually enjoyed his contribution with Rick Wakeman. And I never regret having both laser disc and CD in my collection as they are different. Do I need to elaborate on track by track basis? Nah, I don't think it's a wise idea as I would write a novel-long write up for this wonderful show because as I mention almost all tracks are masterpieces and excellent with only one mediocre one. What can I say then? Well, for sure when the track reaches number 3 "Everyday" which represents my all-time favorite Hackett's songs, I keep repeating over and over. To me, the interlude part which demonstrates long guitar work is like an extended version of Steve's guitar work in Genesis' "Firth of Fifth" on "Seconds Out" version. It's a terrifically rewarding listen for my enjoyment pleasure, really! But actually not only this track that bursting out my adrenalin, other tracks like the opening "Camino Royale" from "Highly Strung" is truly a stunning performance by the band. I like this version because it has an amazing vibraphone solo, flute solo and stunning guitar solo during expanded interlude (compared to studio version). It's rocking!!!! Bravo Hackett!!! "Please Don't Touch! ", "Jacuzzi", "Ace of Wands" "Spectral Mornings" . ohh .. basically you name it from the track list - and take it randomly - I will guarantee it's marvelous! On rating, personally I rate this live set with 5 out of 5 stars. But this time I offer you with four stars and I want to see what do you think after you purchase and enjoy the music. Because I'm sure that four stars is already the definite rating that most of you would agree with me. But, I'm sure also that vast majority of you would rate with five stars as well. GO and BUY THIS CD! Oh BTW, the sonic quality of the CD is top notch! (you won't believe that this is a live record). The first of Steve's many live albums, and, as usual, this one is well up to scratch. It opens with the classic 'Camino Royale', played here flawlessy and at a superb tempo. Its complicated structure holds no fear for the band or its leader, and this epitomises the entire album. The musicians, as always with Hackett, are all top notch, and it's especially nice to see two excellent drummers, Fudge Smith and Ian Moseley, from Pendragon and Marillion respectively, providing the backbone and rhythm to some excellent playing. 'Please Don't Touch' is another wonderful live piece, and this is followed by one of Hackett's best songs, the brilliant 'Everyday'. I've always enjoyed the way this song moves from the almost simple verse, to the brilliant guitar solo that dominates the second half of it, and here it sounds just as good as on Spectral Mornings. 'In That Quiet Earth' is another seemingly effortless brilliancy, bringing back to the listener all those wonderful Genesis-inspired days of the seventies, whilst 'Depth-Charge' is, yet again, memorable; a wonderful mid- paced instrumental that simply flows. Strange how it fades out however as I believe the song, in fact, led into something else at the time. Two favourites from the Defector album follow, the upbeat and sunny sounding 'Jacuzzi' and the sombre and majestic 'The Steppes', each of them powerfully played and well recorded. Of course, mention has to be made here of Hackett minor - John's flute always adds something special to both his brother's and his own work. Lovely stuff. 'Ace Of Wands' is another live gem, and this is followed by 'Hope I Don't Wake', from the much maligned Cured album. 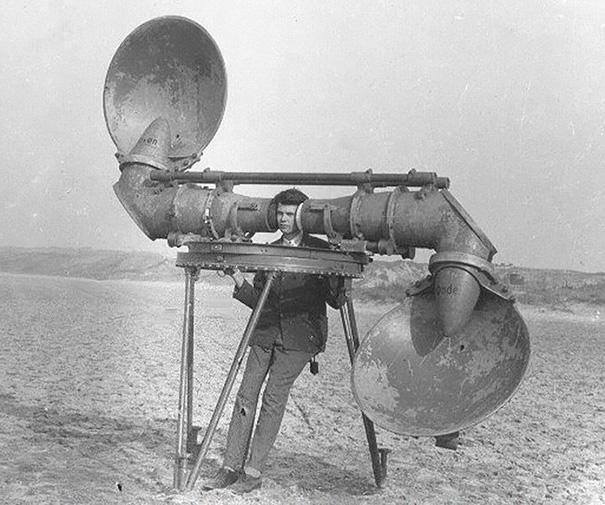 Live it sounds great, and shows off Hackett's ear for melody and harmony. (But I actually enjoy the Cured album anyway - see my review for it!) 'The Red Flower Of Tachai' is just as atmospheric live as it is on record, but this has never been a favourite of mine. Nothing wrong with it, it just doesn't seem to go anywhere. It is nice and relaxing though. Only the first part of 'Tigermoth' is played here, as was usual at the time. Whilst I would have liked to hear the complete song, it still sounds good. This track is one of my favourites off Spectral Mornings'. 'A Tower Struck Down' has all the drama and dynamics of the original, being one of Steve's heavier pieces. 'Spectral Mornings' is as wonderful as it always has been, with superlative playing from Steve and the band. Finally, 'Clocks' ends the record in fine style. Never my favourite track, it is still an enjoyable piece, and is, as are all the others here, well recorded. For Hackett fans, this is a must, as is all his live output. He is one of the few musicians who can cut the mustard both in the studio and live. For those wishing to explore his material, this would serve as a good introduction to his earlier work. Recommended. NB: I have the remastered version, with the same tracks but a different, and to my eyes, improved cover shot of Steve. For a long time, this was the only live album available, and the album was divided in two parts, coming from two concerts almost a decade apart. The strange thing is that the more recent concert came first, but this is really no problem. With the remastered album came a cover change (for the better IMHO) with a few bonus thingies. The Nottingham 90 concert is a very different line-up than from the Spectral Morning & Defector days, but a good part of the tracks come from Steve's early discography (impeccably played, especially Please Don't Touch) with only Camino Royale (from Highly Strung) and Depth Charge as "intruders" on top of the delicious Genesis in That Quiet Earth in a rearranged form. Two more tracks from this show are added at the end of the album, but both Spectral Mornings (obviously part of a medley) and Clocks are excellent renditions as well. The NY 81 show has a whole different feel (the sound is clearer) and the band is more enthusiastic. With both Brother John and Magnus as the mainstays in those days, the group also comprises future Marillion (and ex-Curved Air if memory serves) Ian Mosley and ex-Strawbs bassist Chas Cronk. So we get an all-star line-up starting from the perky and jumpy Jacuzzi and the solemn rendition of The Steppes and its Turkestan influences and the ever-changing Ace Of Wands. However the mood is completely ruined by the atrocious (and very unfortunately-titled) Hope I Don't Wake, which is a horrible AOR (from Cured I think). Thankfully it is short and the next tracks more than make up for it: a rare Red Flower, the majestic Tigermoth (wordless) and an extremely dark Tower Struck Downfrom the debut album. Quite a good release with the remastered version coming with a small Camino PC-only catalogue, where you can find some 20 tracks (16 from later Hackett album, two Chester Thompson tracks and two Ian McDonald tracks) and some Kim Poor artworks, which makers for a nice bonus, even if completely commercial approach. I am one the many that feels that Steve's best works were "Voyage" and "Spectral" and since half of the tracks featured in his first released live album do come from these albums I shouldn't complain too much I guess (but where are Star Of Sirius and Shadow Of The Hierophant? Some other pieces also belong to the best of his repertoire (at the time of recording). "Casino Royale" is one of the very few good songs out of "highly Strong" and this rendition is quite pleasant. Same comment about "Please Don't Touch". Most of the songs are well chosen and belong to the best Steve has achieved. For old nostalgic guys as I am, there is even "In That Quiet Earth" featured. But he will perform most of old "Genesis" tracks in later (and even better) live releases. Some other highlights of his solo career are featured like "Ace Of Wands" (from the great "Voyage"), and "The Steppes" (a favourite from "Defector"). But "Ace" is not really on par with the studio counterpart. A few blunders as well like "Depth Charge" (an unreleased track), but the very bottom is of course "Hope I Don't Wake" (from the extremely poor "Cured"). Once you know that you will listen to this song first thing in the next morning, there is nothing spectral about it, you just hope you won't wake up, that's for sure! The remaining tracks are a pleasant "voyage" through Steve's repertoire ("Voyage" and "Spectral"), but without his acolytes to support him. One of the highlights being Spectral Morning of course. A great performance of a great track. The most symphonic one representated here. Time lapse is a photography technique whereby each frame is captured at a rate much slower than it will be played back. When replayed at normal speed, time appears to be moving faster and thus lapsing (thanks Wikipedia). You have probably seen this technique used to show how roadies sets up the equipment before a show, or a flower blooming, or fruit rot, etc. 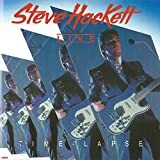 This first official live album by Steve Hackett is probably called Time Lapse because it gathers live recordings from two radically different times and places and puts them together on the same album. Tracks 1-5 and 13-14 were recorded at Central TV Studios, Nottingham in October 1990 while tracks 6-12 were recorded at the Savoy Theater, New York in November 1981. I can say right away that I find the very idea to mix live recordings from two radically different times and places rather strange and I always prefer live albums that represent a single night in an artist's career. Still, this album is full of great live material and had it not been for the fact that there is a live video in existence that features the full Nottingham show without 'time lapses', I probably would have given this Time Lapse album four solid stars. The live video I'm talking about was originally released on VHS under the title Steve Hackett Live, this is the one that I have and it is fully deserving of four stars. The cover art for this VHS of mine features the very same photograph of Steve as is featured on the Time Lapse album cover as listed here (I have seen other versions too). This concert video has now also been re-released on DVD under the title Horizons with a nice(r) cover by Roger Dean- protégé Rodney Matthews (this is the one listed here on Prog Archives and the one that I have reviewed under the presupposition that it has the exact same contents as the VHS version). The first five tracks of the video and the Time Lapse album are identical; Camino Royale, Please Don't Touch, Everyday, In That Quiet Earth and Depth Charge. These songs were all recorded in Nottingham with Ian Ellis on bass, Julian Colbeck on keyboards, John Hackett on flutes and Fudge Smith on drums. At this point, however, the Time Lapse album 'lapses' and turns back the clock about 10 years and continues with a series of songs recorded with another line up, in another country. While the video stays in Nottingham in the 90's for Wonderpatch, In The Heart Of The City, Black Light, Horizons, Jacuzzi, Theatre Of Sleep, Jazz Jam, Spectral Mornings and Clocks, the album instead presents the early 80's recordings Jacuzzi, The Steppes, Ace Of Wands, Hope I Don't Wake, The Red Flower Of Tachai Blooms Everywhere, Tigermoth and A Tower Struck Down with the line up of Chas Cronk (Strawbs) on bass, Nick Magnus on keyboards and Ian Mosley (Marillion) on drums. The album then returns to Nottingham once again for Spectral Mornings and Clocks (which again are identical to the video). I must add that I have not compared the video and the album side by side. But my theory is the following. Tracks 1-5 and 13-14 of the Time Lapse live album are identical to the ones featured on The Steve Hackett Live VHS that I have. Further, this VHS and the DVD called Horizons have identical contents. If this theory is true, I strongly recommend getting the Horizons DVD as it has better cover art and hopefully higher sonic and visual quality compared to the VHS version I have (not that it is worse that most VHS cassettes in those respects). Most importantly, the video does not 'lapse' time like the album does, plus you get the visual aspect that you don't get with an album. The conclusion of all of this is that while the Nottingham show is indeed very good, Time Lapse is not the best way to get this show and this album is thus not an essential release. If you are interested in the Nottingham show, get the video version. And if you are interested in the New York show, it can probably be had on its own in some form or other too. However, as I have as many as eight different live releases from Steve Hackett, six of which are videos! I can say that, even if it is very good indeed, the Nottingham show is not the best of the lot. Among the six videos I have, I very highly recommend The Tokyo Tapes, Once Above A Time and Somewhere In South America first, and if you still want more after these get the Nottingham show (i.e. the Horizons DVD) (not to be confused with the acoustic DVD Hungarian Horizons which also is a very good DVD featuring one of Steve's all acoustic performances in the new millennium). I hope that this review helped to clear up a few things in the confusing (but highly rewarding!) Steve Hackett live catalogue. Steve Hackett really needed a good live album in 1992. Aside from Momentum (a bunch of classical guitar pieces) and GTR (a pile of unspeakable awfulness), the last the world had heard from Steve was Till We Have Faces in 1984, and the world needed to be reminded that Steve had some really nice material under his belt at this point. This is a 1-CD release taken from two different eras (the beginning and end from 1990 performances, the middle from performances from the Cured tour), but there isn't a sharp distinction between the two halves, and it makes for a good live sampler. Aside from a single new piece ("Depth Charge," a decent instrumental based around a majestic synth riff, and which would later be renamed "Riding the Colossus"), the material all comes from 1982 or earlier, but that's ok; I wouldn't have minded hearing a random track from Faces, but I can understand not including anything from the acoustic albums, and of course he wasn't going to go out of his way to remind anybody of GTR. I'm a little surprised that a live album with only 14 tracks would include a whopping 5 from Spectral Mornings, but then again that was a great album, and I definitely don't mind hearing material from there again. The title track seems a little odd as a climactic crowd pleaser, but I can understand using it that way, and it sounds fine to me. I'm definitely happy with how the "Every Day" instrumental passage translates into live performance, and it's definitely a lot of fun to have "Clocks" as a closer (especially with the drum solo reduced to almost nothing). I appreciate the renditions of "The Red Flower ..." and "Tigermoth" (drastically shortened, with the song portion eliminated), too. There are plenty of other attractions, though. I liked "Camino Royale" just fine in its Highly Strung version, but I'm glad I heard this version first, because it's much better. Steve's voice is stronger now than it was when he first recorded the song, and he makes a good choice in allowing there to be some harmonies whenever the chorus is sung; it now sounds fuller and less clunky. Also, the instrumental passage in the middle is great; there's a lengthy sparring between Steve on harmonica and John on flute that should have always been in there, and of course there are nice bits of guitar to flesh it out. Yup, this is one of the main reasons to get this album. Another main reason is the reworking of "In That Quiet Earth," way back from Wind and Wuthering. The first half of the track is done basically in the same way as it was originally, but whereas the second half of the original featured a goofy mix of "tough" guitars and synths, this version opts for a soft, mystical flute-driven passage in the second half, and it improves things considerably. I like the original version more than I used to, and I definitely like the Genesis Revisited 2 version in context, but this is still my favorite version of the track. There are nice performances elsewhere, but aside from "Ace of Wands" (from 1981, full of glorious atmosphere and the joy of hearing Steve and his band working so hard to reproduce all of these fun licks) there's no real need to namecheck all of them. Overall, though, while this may not be an essential release (and it's not even his most essential live release), it's still an extremely enjoyable listen for somebody who's heard the first few albums a bunch of times and would like to hear some alternate versions. And really, that's not a bad thing. 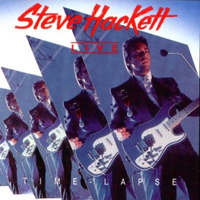 Post a review of STEVE HACKETT "Time Lapse "